This is the first issue of the Journal of Defence & Security Technologies (JDST), published by the Defence Institute “Prof. Tsvetan Lazarov,” Sofia, Bulgaria. There are hundreds, possibly thousands of scientific journals presenting new re­search results and advances in technology, and many of their publications are rele­vant to the field of defence and security. And yet, the core of the editorial team decided to launch JDST, aiming to position it as a forum where research results and technological developments are presented and discussed in view of policy needs, in terms of both operational requirements and future capabilities, support to policy formulation, and the ways in which R&T facilitates innovation in defence and security. This issue is focused on technologies in support of law enforcement agencies. Several of the contributions reflect research results in the HOMER (Homemade Explosives and Recipes Characterisation) project, supported by EU’s Seventh Framework Programme and aiming aim to develop a knowledge management platform which will improve the capacity of security and law enforcement agencies to deal with current and anticipated threats of homemade explosives. Williamson, U., & Stoianov N. (2017). Technologies in Support of Law Enforcement: Characterisation of Homemade Explosives and Recipes. 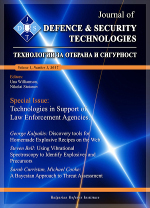 Journal of Defence & Security Technologies. 1(1), 9-10. Tagarev, T. (2017). Defence and Security Research, Technologies, and Innovation. Journal of Defence & Security Technologies. 1(1), 5-8. The EU Cyber Policy Framework (CDPF) as adopted in November 2014 at the Foreign Affairs Council is the major policy mechanism for achieving the EU cyber defence objectives. In that respect, the aim of the Cyber Defence conference is to highlight the necessity of rapid response and how the associated challenges can be met through different research and technology, education, training and exercises initiatives at EU level. Recent European Defence Agency (EDA) and NATO Science and Technology Organization (STO) technology foresight publications identified potentially disruptive technologies and discussed how the science and technology may affect the capabilities development of the EU and NATO.